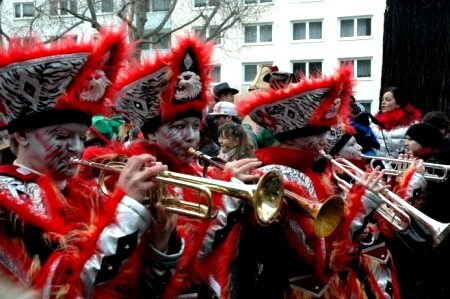 Rain, sunshine or snow, the Mainz Carnival culminates in the Rosenmontag (Rose Monday) Parade. 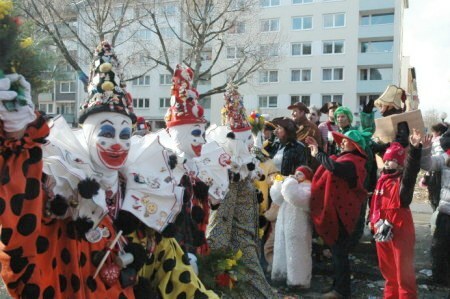 Fastnacht or Fashing is the local name for Mainz Carnival and it is not locallycalled the 5th season for nothing, as it is a time where locals who enter into the nonsense that is carnival do so with gusto and the whole city takes on a carnival spirit. 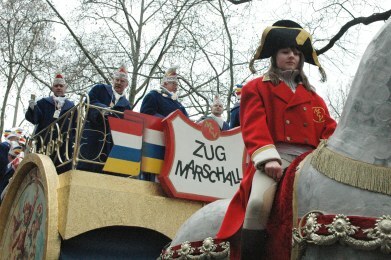 The Parade Marshal is escorted by giant steeds ridden by young cadets of the carnival associations. 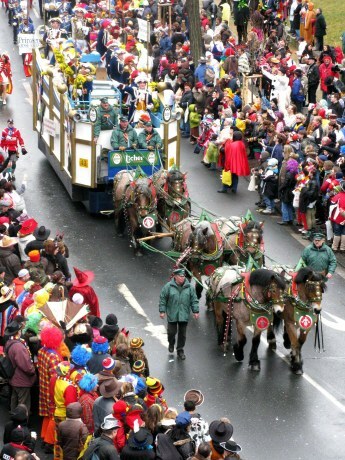 The real horses follow along the parade route. 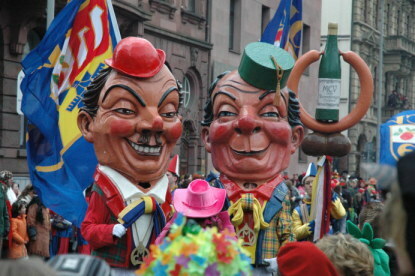 On the Monday before Shrove Tuesday, the traditional Rosenmontag Parade that is the focal point of the whole Mainz Carnival season takes at least five hours to pass. There are masses of bands and flag twirlers. 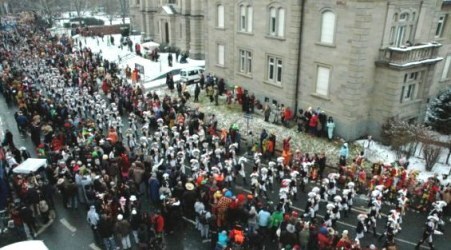 The Gardes march in their hundreds. 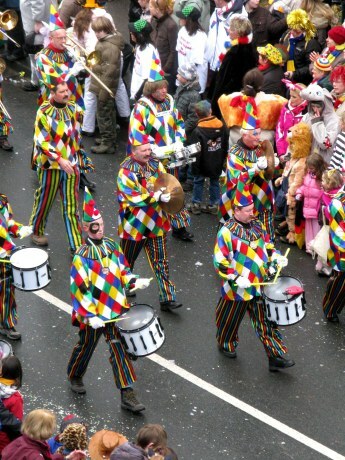 Gardes are like the Carnival Krewes of New Orleans - associations that undertake charitable community works throughout the year and march en masse and in fantastic uniforms during Mardi Gras or Carnival. 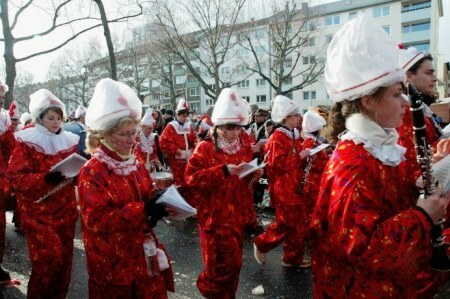 The Carnival associations uniforms hark back to the early 19th century being then parodies of those of the occupying forces who from time to time have occupied Mainz, which since Roman times has been a strategic Rhineland city. 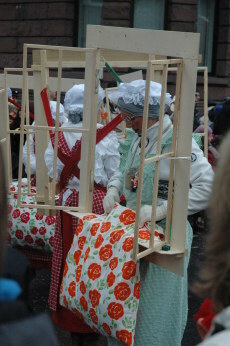 Carnival Association members follow behind their silver Glockenspiel. 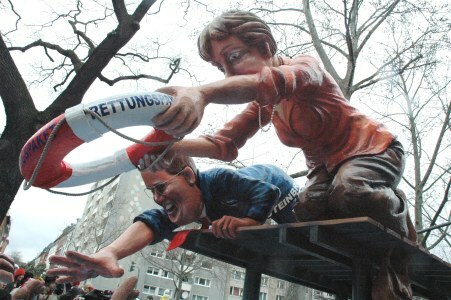 The political heads are giant caricatures of the politicians of Rheinland Palatinate German state of which Mainz is the capital. 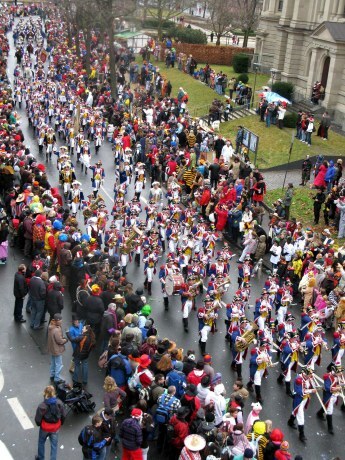 There are troops of baton twirlers, some high-stepping. 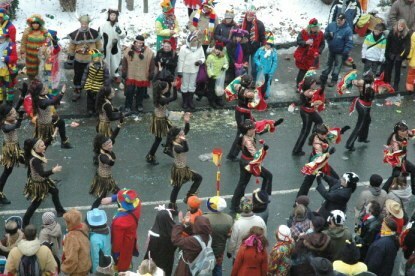 Others are a swirl of colour and feathery hats: dancing baton twirlers. 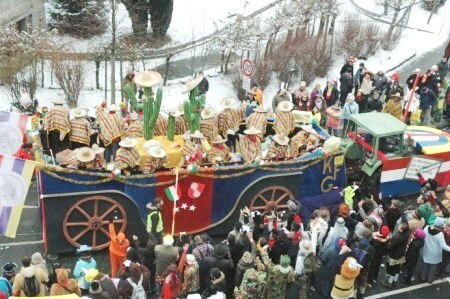 Being used to a parade in an English speaking world I marvelled at the good behaviour of the crowd in letting the parade travel unobstructed despite frivolity on the frings. No security officers every few paces saying what you are not allowed to do - just an expectation that people will behave as one would wish. 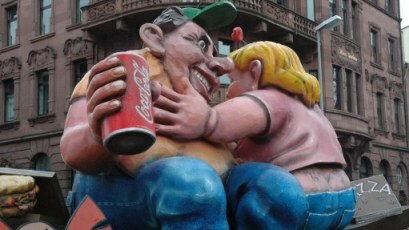 I had heard that, like in Mardi Gras in New Orleans, out-of-town-visitors come to the city to get drunk and behave badly - and generally that takes place in a particular area of a few blocks in the centre of the city. 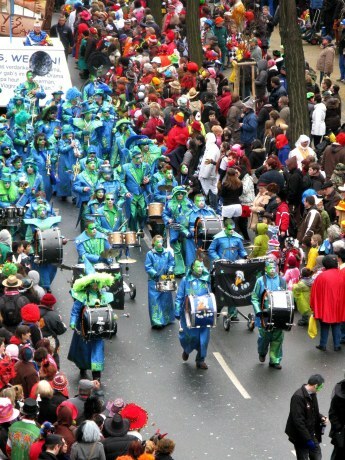 The other remarkable thing beside the sheer number and size of the bands, was the magnificence of the floats but the fact that where we have float, people, float, people, band, float, float, float, float band - here in Mainz carnival it is pretty much: float, band, float band.floats. 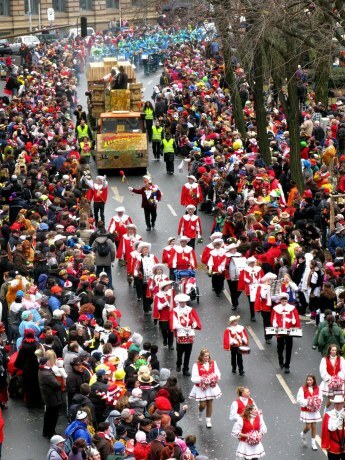 A visiting friend from England, herself a brass-band member, was over-awed by the sheer number of bands. …and the number of band members in each of them. 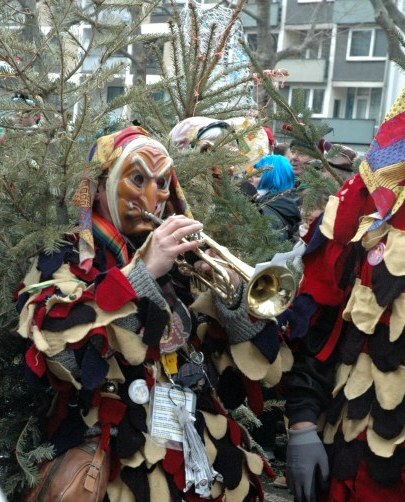 While apparently the English find it difficult to gather together enough to make a decent band, each local community around Mainz takes great pride in developing its band music. 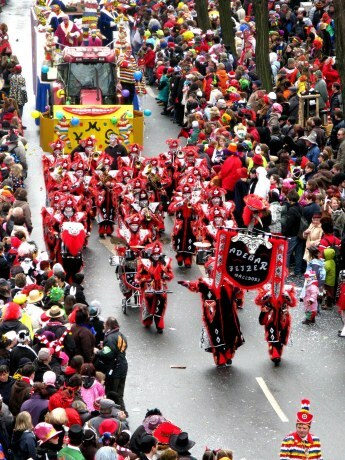 This is an important accent to the many occasions that the people of Rhineland Pfalz find to celebrate – the 5th season of Carnival being just one of the bigger parties. 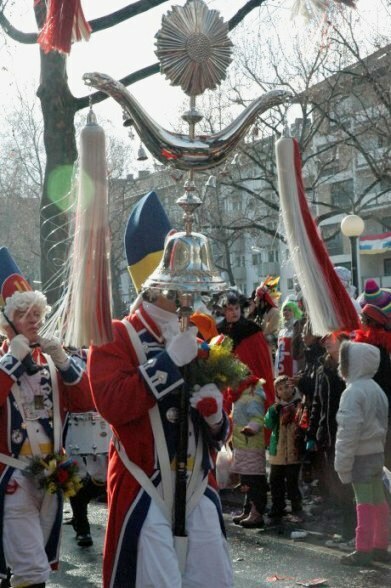 In English brass bands there are usually no trumpets. 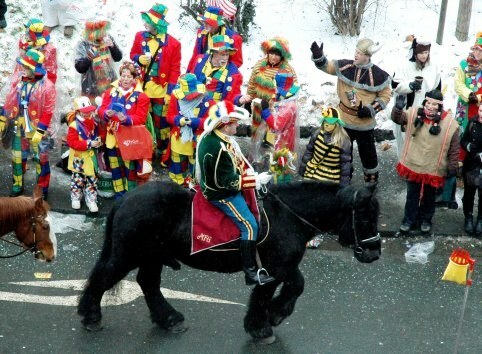 …or by other dark imports from the mountain regions, where Fastnacht or Carnival is a time to ward off the mountain spirits. 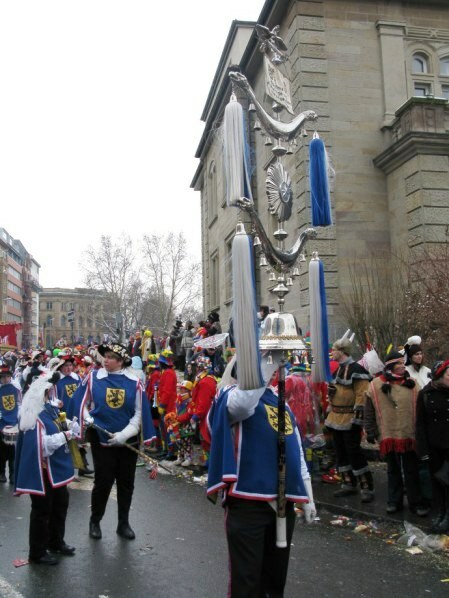 There are showers of tape-like confetti that, as in Switzerland, is all of one colour. 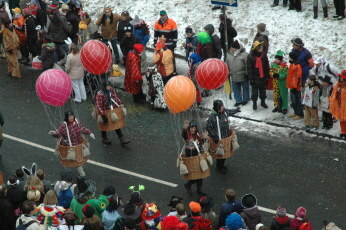 The confetti was introduced to replace the candies that were thrown from earlier parades but banned for a time. 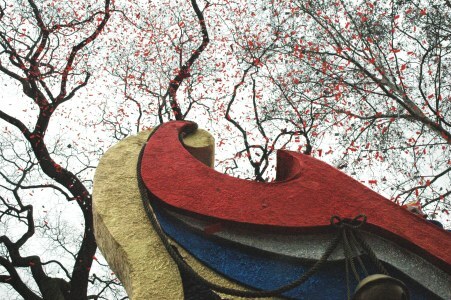 The philosophy about it being one colour was that if it was picked off the street to be thrown again, it would be recognisable as such –as if it were multi-coloured, it would be hard to distinguish between the fresh confetti and that mixed with rubbish from the street. 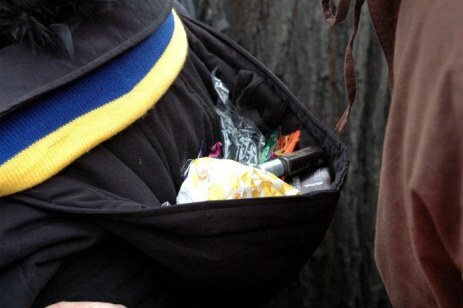 …but the big kids keep their goodies in more creative storage, like the hoods of jackets…. 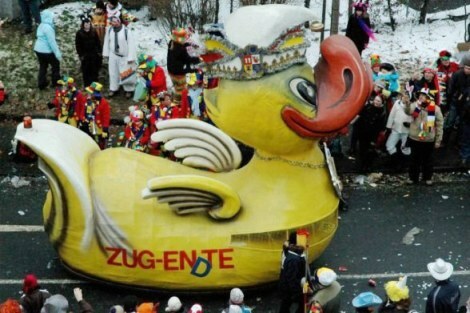 … and are sometimes thrown things that are definitely not meant for children. 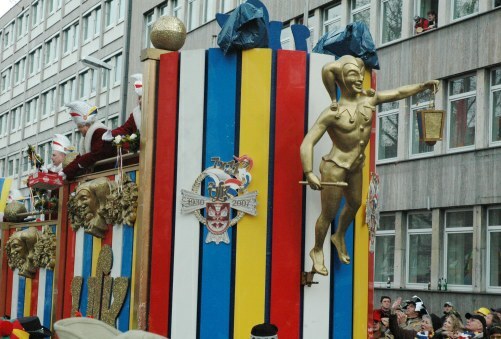 The Mainz Rosenmontag Parade was not always political, but since the mid 1800s, it has been an opportunity for social comment. 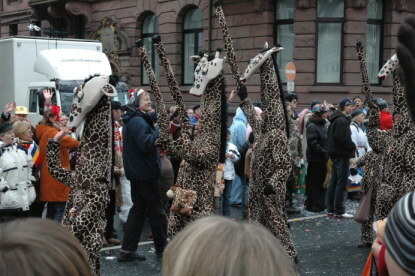 Mainz Carnival is known to be the most political of carnival celebrations in Germany. 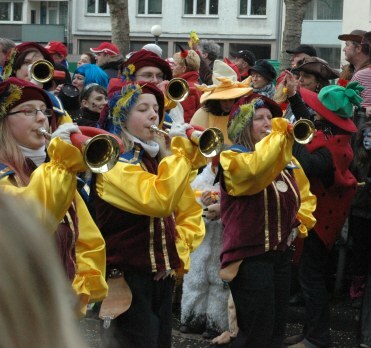 It is all taken in good humour by the local politicians who are lampooned in the various sitzungs or 'sittings' where crowds of people all in costume listen to a sort of cabaret of satire – all in verse, intermixed with performances by local talent and favourite Fastnacht performers. The pinnacle of these is the 'Mainz sings and laughs' Sitzung that is televised. 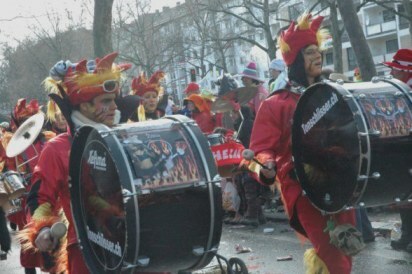 It is a favourite group-watch event of the 5th season. Friends gather at someone’s home to listen to the doggerel and laugh along. …and a useful play on the election phrase “Yes. 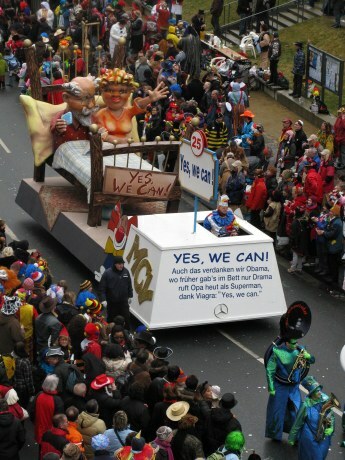 We can!” …with a metaphor involving Viagra! 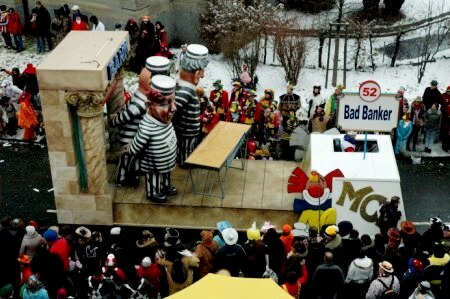 …and the “Financial bail outs” also are an ongoing source of Mainz carnival float themes. …and the whole debate over swine flu…here seen to have radical side effects! 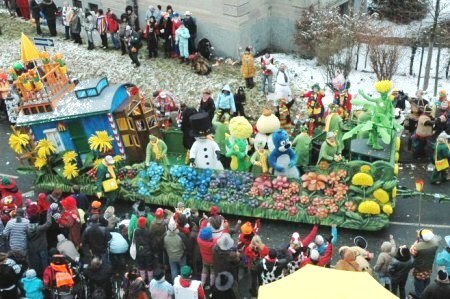 Not all floats are political. 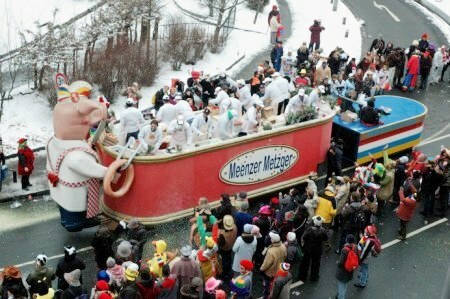 Some just celebrate the various guilds – such as this one for the German Master Butchers and Smallgoods makers, the Metzgerei, who throw good German Wurst (salami) to the hungry crowds. …and some are just plain fun. 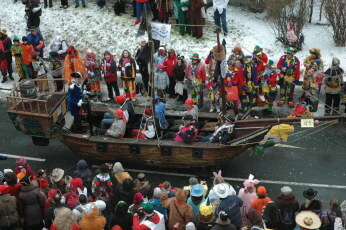 …or the traditional cavemen who annually bare themselves to the elements, regardless of the weather: a good time is had by all. 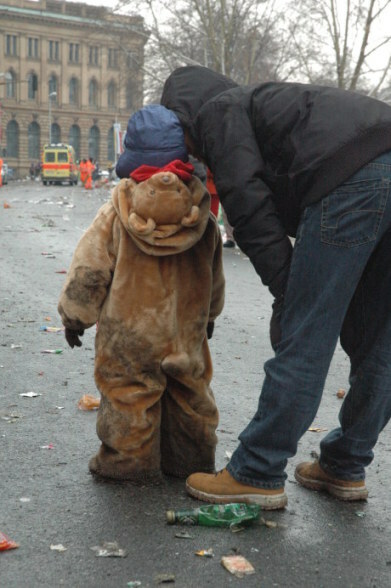 …there was plenty of rubbish on the streets. 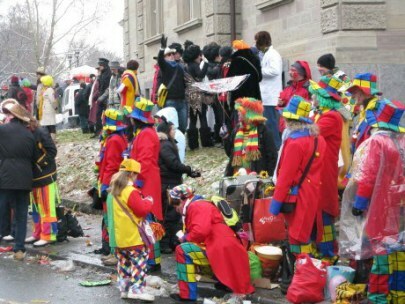 As the crowd wandered to its next party location to end out Mainz Carnival, the clean-up teams were hard at work. 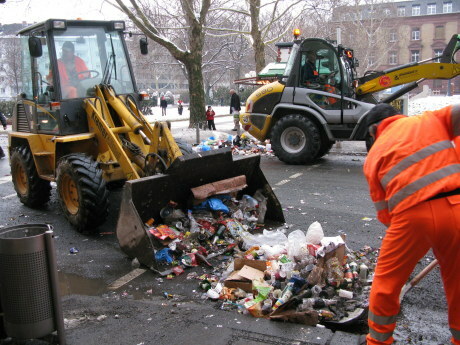 With German efficiency, within twenty minutes the streets were swept clean. This left some people wondering where all the magic had gone! There is no real ending. where you stop the story.